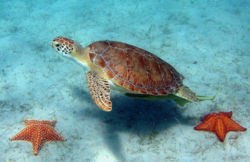 The green turtle or green sea turtle is a species of sea turtles with the scientific name Chelonia mydas. According to the Bible, God created this animal on the fifth day of creation along with the other sea creatures and birds. These Sea Turtles are very popular and even featured in movies such as Finding Nemo (characters Crush and his son Squirt). Males are known to never leave the water after their birth and the only ones to leave are the females that go to shore to lay their eggs. The green sea turtles prefer temperate climate that is mildly warm and not too hot or cold because they are fairly sensitive to one being dominant over the other in temperature. Green Sea turtles eat seaweed and algae and are carnivorous only when they are young and mostly an herbivore as an adult occasionally eating other small sea creatures. Just like flamingos getting their color from what they eat is the same for the turtles and from eating the seaweed and algae it gives them their greenish mixed color. Fibropapillom is a virus killing off turtles worldwide. A turtle hospital in Marathon, Florida that is trying to help and find a cure for the disease. There have been researcher’s attempting to analyze the disease for the last fifteen years between the turtle hospital and the University of Florida has pointed it out to be some kind of herpes virus and is still characteristics researched in depth to this very day. Fibropapilloma causes large warts with similar qualities to that of a cauliflower as in the texture and they grow on all the soft tissue areas of the turtle and can also grow on the mouth, eyes, carapace, and plastron. Not only can these tumors grow externally, but they can also grow internally and can grow on the lungs, kidneys, liver, and intestines. The tumors range in size, shape, and color. The tumors can be black, white, pink, and can be less than a centimeter in size or bigger than a football and the biggest recorded one was well over three pounds. The disease originally dates all the way back to the nineteen hundreds and has reappeared and regressed throughout the century appearing on sea turtles in warm waters usually and around the equator from Florida and South America to Hawaii with few cases documented around Australia. Though this disease is seen on a variety of sea turtles worldwide it is commonly known to be mostly attracted or is just commonly seen on the green sea turtles. This disease attacks sea turtles no matter what they’re development is whether they be a youngling or an adult. Chelonia mydas-Green Turtle Australian Government. Chelonia mydas Janel Crite. Animal Diversity Web. The Turtle Hospital The Turtle Hospital. This page was last modified on 1 January 2009, at 14:41.